On opening the bottle the ginger smell from the off-transparent slightly yellowish beverage wasn't hugely nose tingling like I'd expect from an actual ginger beer. There was plenty of fizz on pouring though. 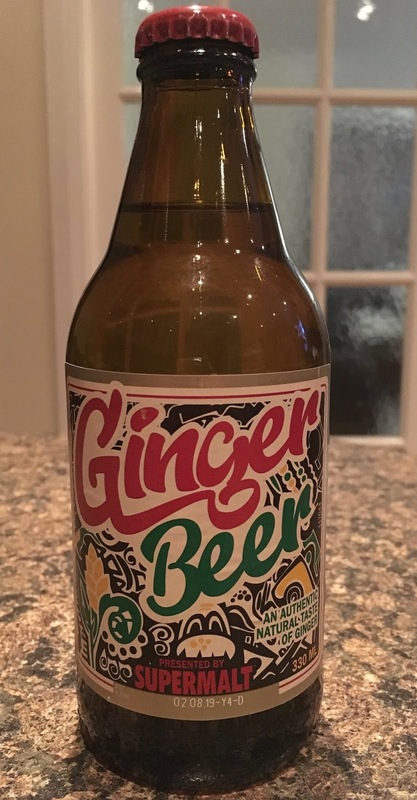 There followed the mild sweet taste of ginger 'ale', rather than the fermented 'beer' variety. It's a pity in a way that I did the experiment and found out the difference between the two, but we live and learn, and it should be a good thing to expand our knowledge on all things. Perhaps Supermalt need to do some searching on Google too, before they produce anything else that's not what it seems? One thing I did notice from this drink was that the ginger was a pretty much overshadowed by the sheer amount of sugar. 16g of sugar per 100ml of liquid is quite a lot, especially as it was mostly all I could taste, asides a heavy touch of caramel syrup to add even more sweetness… wouldn't want any of that fiery ginger flavour to worry anyone now, would we?